I can't believe it's October. It's always a fun month and this year will be no different. 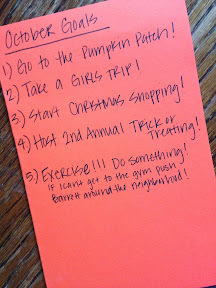 I've got a few October goals. First lets review my September goals...1) Make a budget, I did sit down and write out my budget for the month. I've struggled to stick to it though. I don't know why it is so hard for me but it is. 2) Cook 5 nights a week. This did not happen but we did eat out less that the previous month. I tried to cook things that we could eat more than one night and that worked for us. 3) Go to the gym. This did not happen. I wonder if it will ever happen again. 4) Start planning for the Holidays. I did get my Christmas shopping list made out. I got most of Barrett's birthday playdate planned. I worked on the menu for our Halloween party. I'm pleased with this goal. 5) Clean out guest room. I'm proud to say I got this mostly done. I've still got a few things in there that don't belong in there. But overall it's a thousand times better. 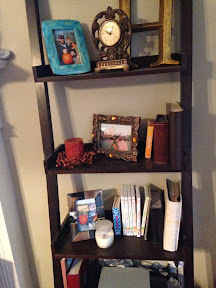 6) Decorate for FALL!!! I finally got this done this week. I added a few pictures but it doesn't look much different than every other year. I feel like I usually have more but this was all I could find. These pictures are terrible. I put some pumpkins on the mantle in my glass jars. Added some fall flowers and my scarecrows. 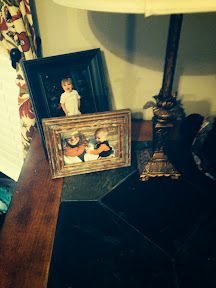 I also added a picture of Barrett from Halloween in the little frame. 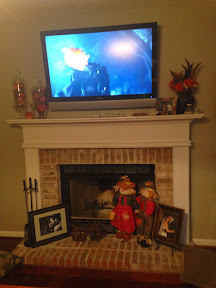 I just added a fall candle and some pictures from last Fall in the frames. My wittle baby from the pumpkin patch last year. Now on to October's goals. 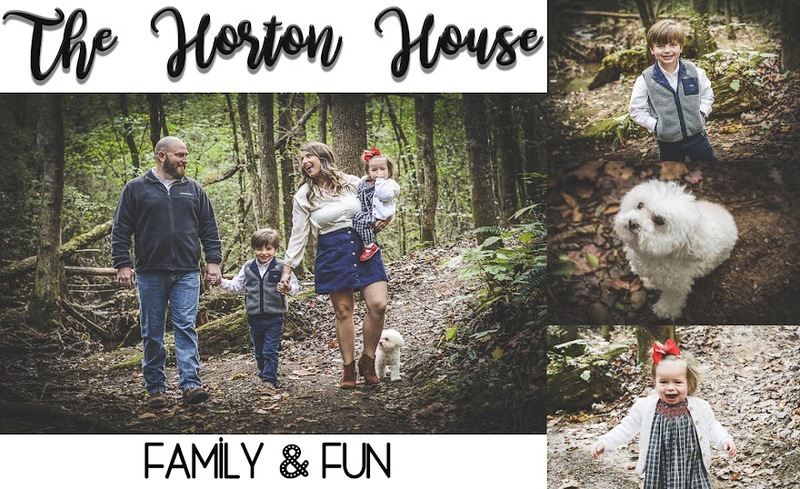 I purposely made these a little easier and fun for the season! 1) Go to the Pumpkin Patch! I loved taking Barrett (and Patrick) to the pumpkin patch last year. I can't wait to go this year because I know Barrett is going to enjoy it so much. 2) Take a Girls Trip! I kinda cheated on this one because I've been planning this girls trip for months. I'm so excited! 3) Start Christmas Shopping. I've already bought a few things but I'd like to be done by the end of November. 4) Host 2nd Annual Trick or Treating at our house. Last year we had a few friends over to eat chili and trick or treat and we had so much fun. We're planning on doing it again this year. 5) Exercise!!! Clearly I'm not getting to the gym as much as I'd like to so I'd be happy to just get out and walk the neighborhood. We get out most nights but I don't move as much as I should.